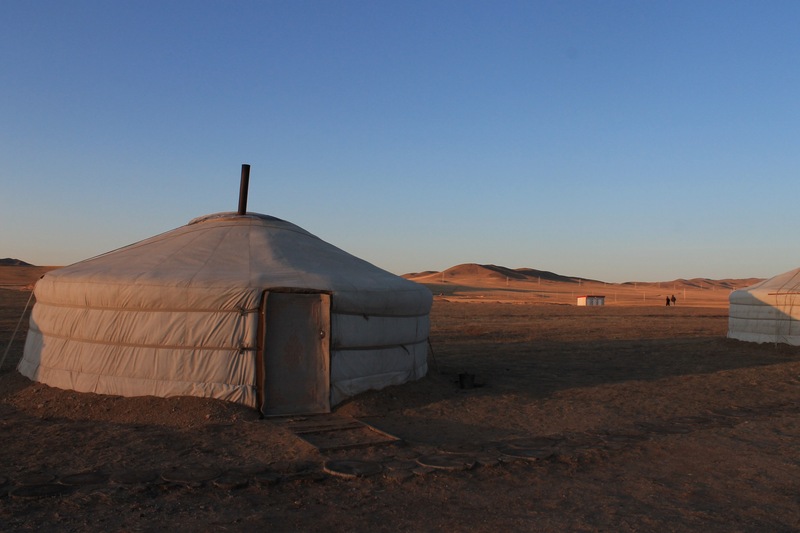 We reached Ulaanbaatar at sunset, spending one night in a city hotel to shower and pick up provisions before travelling onwards into the desert the next day. 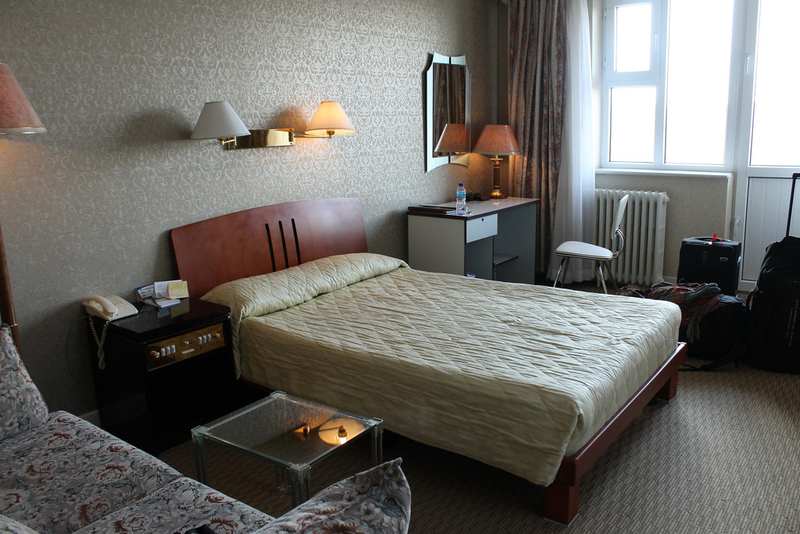 The decor in the hotel made feel us like we had stepped back into the 1950′s, with a faded American-style bar in its basement, completely at odds with its desert surroundings. The city was dusty and more built-up than we were expecting, so it was a relief that we had arranged for a local guide, named Odtka, to take us out to the desert the following day. She picked us up in a Land Rover and told us not to get used to the ‘road’. We were only on it for about 45 minutes before it ran out and we were driving over the rough terrain of the thawing desert. 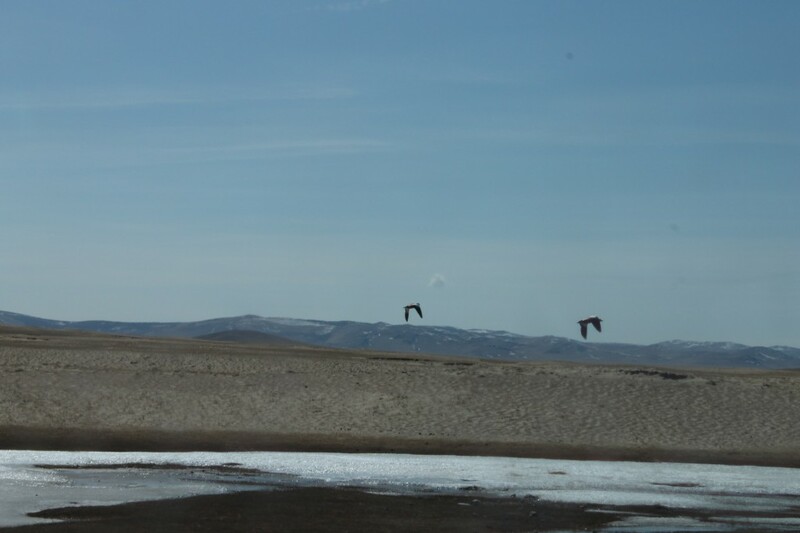 Passing over the last ice-covered streams, we disturbed a pair of Bar-Headed Geese along the way. In the distance we could make out the occasional Ger, surrounded by mountains, scrubland and packs of wild horses. Another hour passed before our guide pointed out a solitary settlement of a couple of Gers and a stable – she explained that we would have lunch here. 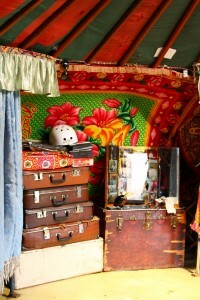 A small family welcomed us inside a large Ger to a brightly painted room filled with suitcases, three beds and a fire. 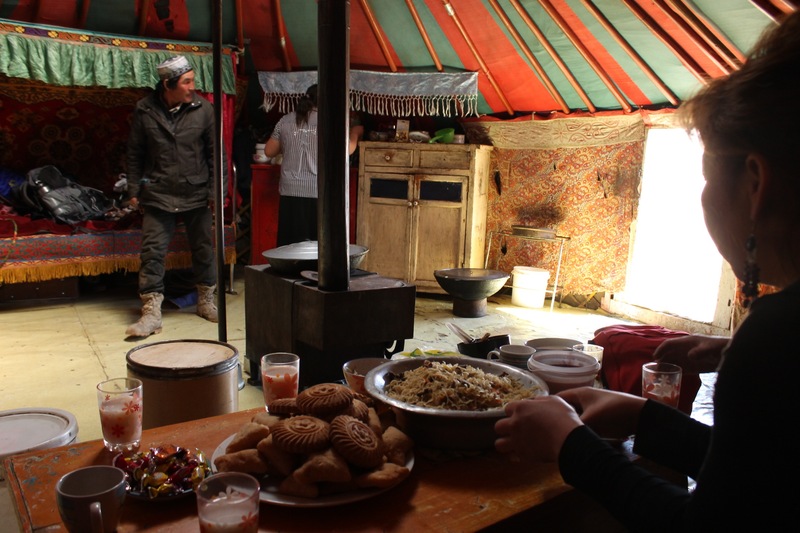 The fire is the central point of every Ger as it provides essential heat and acts as a stove (in these conditions and in this nomadic lifestyle the fire is sacred). The father of the household was resting on his bed, watching Mongolian game shows on a small black-and-white television powered by a car battery. 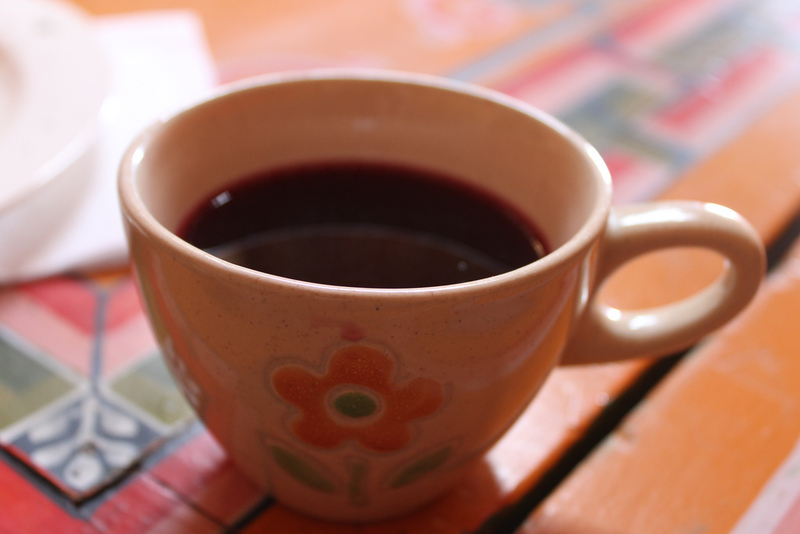 His wife was tending to the food: bubbling on the hearth was a stew and next to the a table with a plate of home-made biscuits served with blueberry jam. 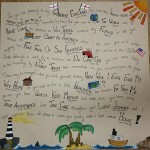 We were invited to join them for lunch and we ate mutton stew and noodles washed down with glasses of salty mare’s milk. Next to the house was a small wooden stable which sheltered goats, and was protecting the first spring kids and their mothers from the cold desert winds. 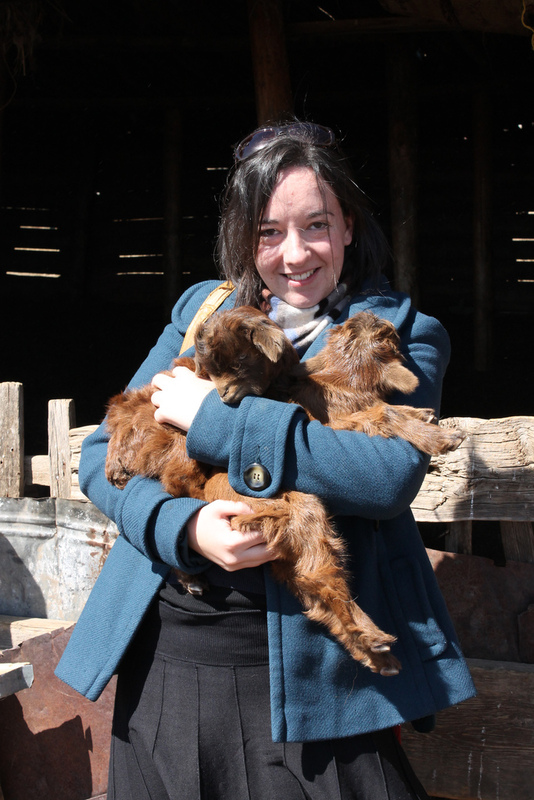 The father of the family came out and showed us a pair of brown goat twins who had been born a week ago which he promptly thrust into our arms. The family also had three dogs, three horses and a cat whose newly-born kitten was taking a nap in a child’s toy castle. Spring was in the air and with it came an air of celebration and a focus towards renewal and rebirth. 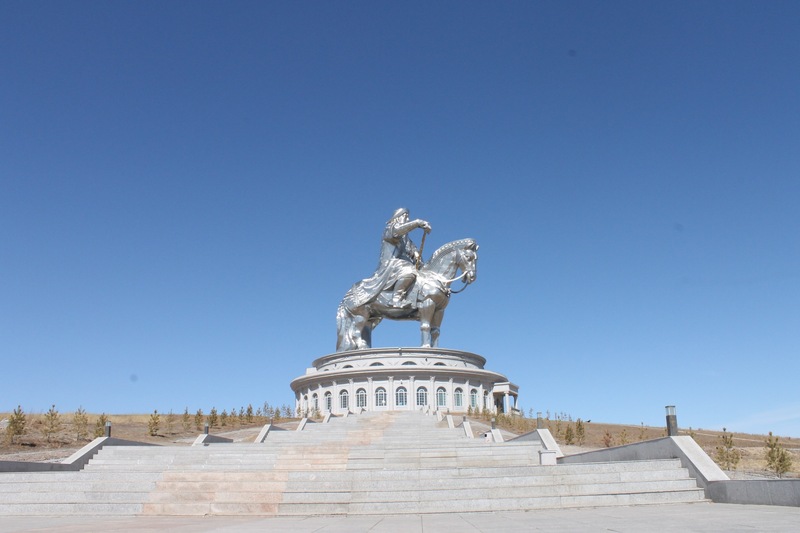 After lunch, we said goodbye to the family and were taken to the museum of Mongolian history which is housed within a giant, hollow statue of Chinggis Khan (the common Western transliteration ‘Genghis’ isn’t quite right, we found out). 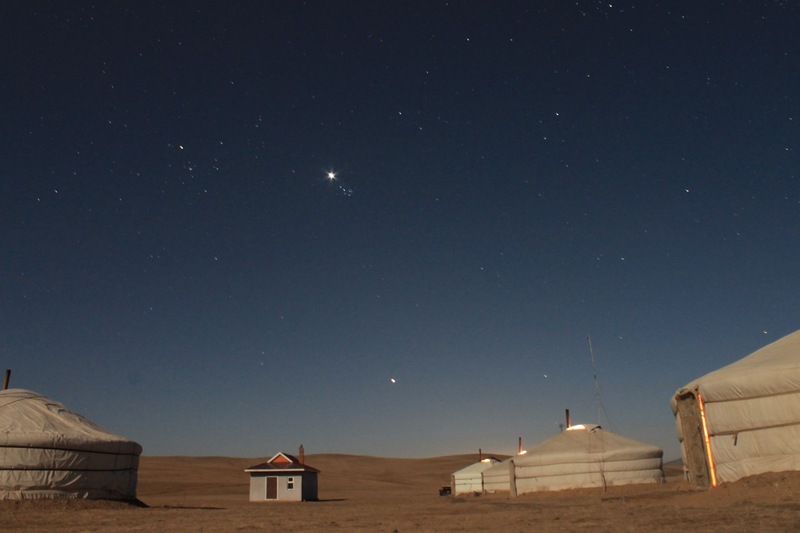 The founder’s original vision for this desert folly was to create a hub for Mongolian tourism with a tourist Ger village surrounding its base. Sadly, before even the statue could be completed, he was killed in a car accident. 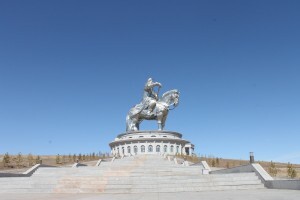 Others are continuing his work, however (although the Ger village is thankfully on hold), and the collection of artefacts from the era of Chinggis’ rule were on the whole fascinating – (I say on the whole because of the giant Mongolian boot). 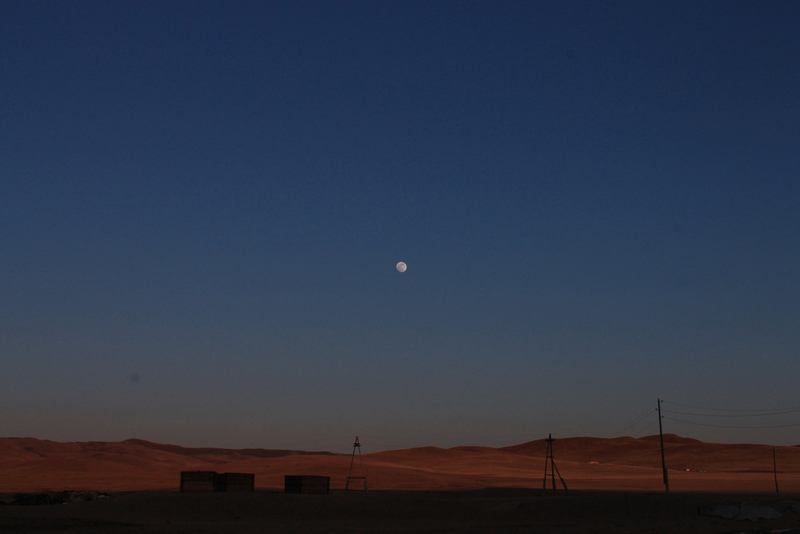 Just before sunset, we were driven to our home for the next two nights – a settlement of ten Gers in a desert valley. The pipes hadn’t yet thawed enough for the shower and toilets to work so washing was from a bucket of water, and the toilet was an Eco style sawdust arrangement a couple of minutes walk from the camp. As we settled into our tent (which was beautifully painted) and wonderfully warm thanks to the fire, we stared to smell tempting aromas coming from the ‘kitchen’ tent a couple of rows down. A gong soon sounded to announce dinner and we sat down along with seven other guests (4 Irish and 3 Australian) to a simple but hearty dinner of pasta and mutton with blueberry juice (with or without Chinggis vodka). We also managed to try some booz’i, the spiritual precursor to dumplings such as Dim Sum and ravioli, which were brought to Peking (then known as Karakorum) by the Mongolian army and, suitably dried, allowed them to travel huge distances across the desert. By evening the temperature had dipped to – 10 so it was important to keep the fire in the Ger going all night. We were told that someone would come in and light the fire every couple of hours so not to worry if we heard the door open. The next morning we awoke in our toasty Ger to a beautiful sunrise. After a breakfast of blueberry jam and biscuits, we we went for a morning walk across the desert, aiming to climb a hilly peak in the distance. We navigated our way through thawing streams and herds of horses which had recently been let out to pasture now the worst of the winter was over. 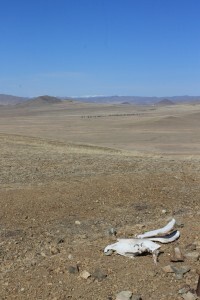 From the peak of the hill we could see them in their winter coats, clearly enjoying their freedom – bucking and playing – which was in stark contrast to the few horse skulls on the hillside left behind by those who had been more unlucky. 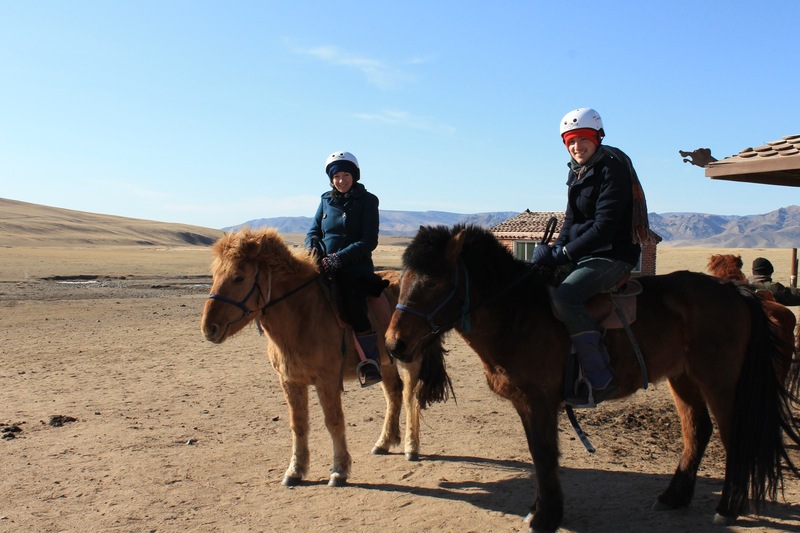 When we got back to camp we were asked if we’d like to see a little more of the desert on a horseback with Batsuk Ala, the local horseman. I hadn’t ridden for a few years but we thought it would be a good way to explore. 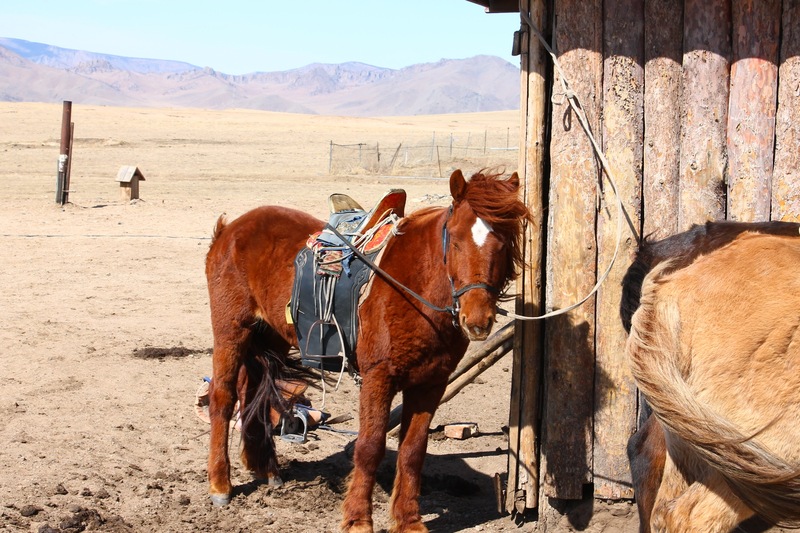 The horses were frisky and clearly weren’t enjoying having their saddles back on after six months of freedom. As we rode out we passed a grazing herd of horses which which began to Whinnie causing my horse to strain and veer off in their direction. The horseman told me to say chu firmly which seemed to work. There was something rather magical about riding over the desert terrain with no sign of settlement or other humans around. The horses obviously knew their way home and I barely had to touch the reigns on the return which was a bit of a relief. We got back to camp in time for sunset where our surroundings glowed red making us feel like me were on a moonscape. 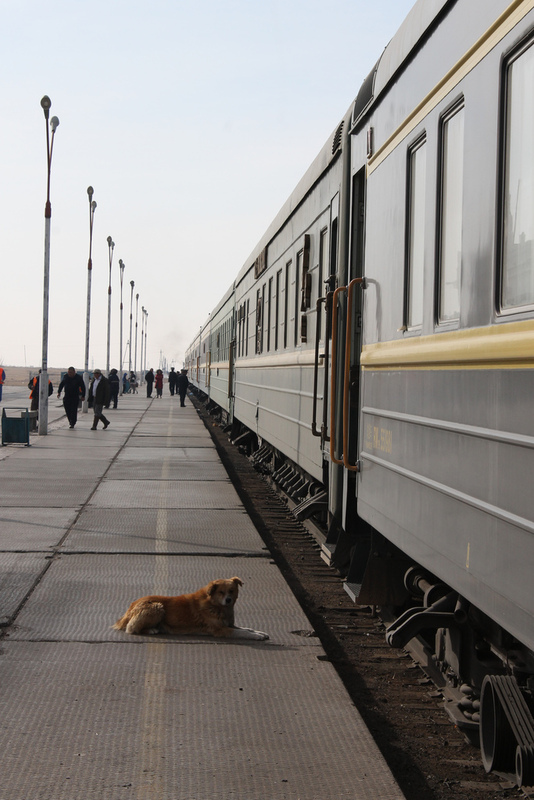 Two days didn’t feel long enough as we prepared to return to Ulanbaatar the next morning to reconnect with the Trans-Mongolian train which would take us on the five-day journey to Moscow. 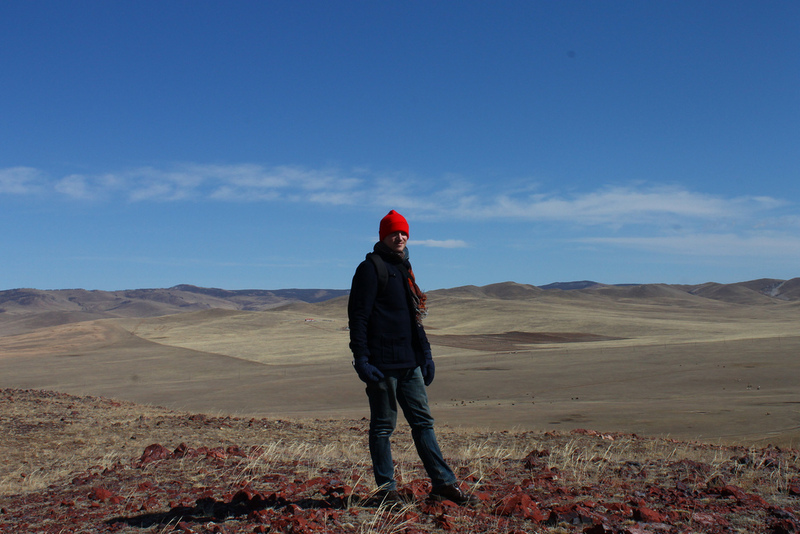 On the journey back, Odtka told us about the significance of the Mongolian flags which we passed along the roadside. These are part of a worship ceremony and each colour held different significance – red = fire; white = compassion; yellow = sun; blue = sky; green = earth and black = burial. 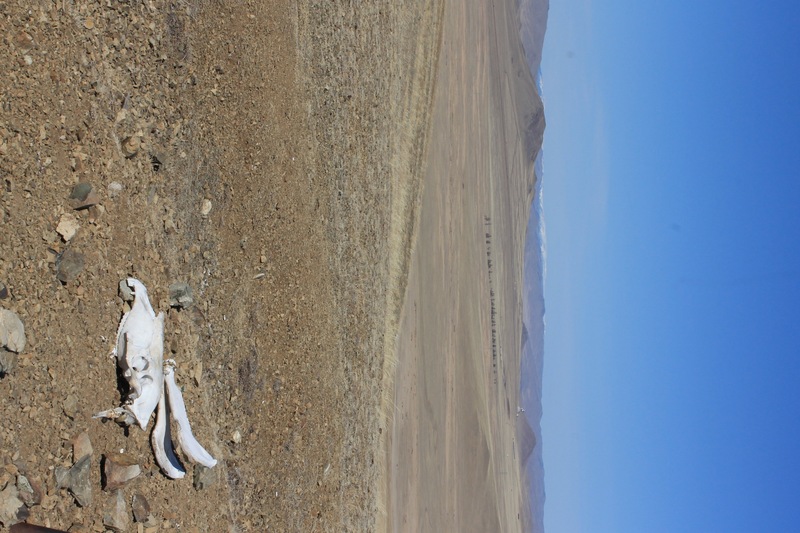 In Mongolia (Buddhist style) sky burials are common wherein a corpse is left without protection in a specific place (such as a mountain top) for the elements to take it – it is essentially given back to nature. Odtka also showed us how our names would be written in Mongolian (where letters are written vertically rather than horizontally). 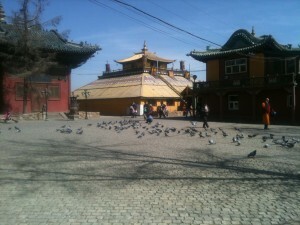 Before reaching the station, we had just enough time to stop at an old Buddhist temple and have a look around. Giant prayer wheels and an ancient wooden temple-front had been beautifully preserved, and despite the best efforts of the Soviet-era government, who destroyed many of the temples, a large number of Mongolians practice Buddhism today. 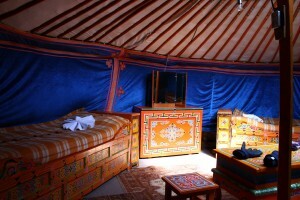 This entry was posted in Travel and tagged Chinggis Khan, Ger Camps, Mongolia, Trans-Mongolian, Trans-siberian, Ulaanbaatar. Bookmark the permalink.